I know Google has said that with the Google Medic Update that started around August 1st that there is "no fix." Google just wants you to make your site better and over time, you might be rewarded. But SEOs and those impacted in a negative way want to know what they can do to recover. While I personally cannot say you need to remove bad links or improve your on page SEO, I decided to run the survey data through a toolset named Cora that has a reputation of going deep into the site's data to see what it can improve on with SEO. I am not an SEO, I have never used SEO tools for improving SEO rankings but I wanted to share what this tool is saying, at least off the survey data, on specific SEO tactics someone can take to make their rankings better after this update. Before I begin, if you missed it, this survey data really showed in a very weird way that a nice percentage of sites impacted were in the medical and health niche. That is why I named it the Medic update - but yea, I know, my survey data is limited. In any event, looking at the survey data Cora was able to compare the sites that saw a positive ranking boost, to those that saw a negative ranking boost, to those who currently rank well for those keyword sets and see a commonality between all of them in terms of on-page and off-page SEO. What it found in general was that the ones that saw a decline also do fairly poorly with having the keywords they are trying to rank well for as often in their content. Things like keywords in sentences, in list tags, term frequency, and other areas of the keywords appears in the content and HTML were generally lower between the sites that took a hit and the sites that are doing well. On the off-page side, most of the sites that took a hit also are not doing as well with off-page link signals. Cora measures data from Moz and Majestic and it showed the sites that saw the biggest decline had the worst backlink profile of the ones doing well. So better on-page and off-page SEO is needed? Any SEO could have told you that? Probably. But it is super interesting to see this plotted. 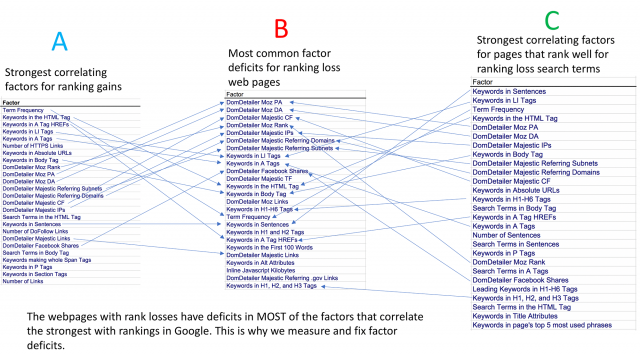 In the image below, Cora plotted A, B and C.
We help hundreds of SEOs and agencies solve these common rank loss problems everyday. 95% of the time, if you can figure out how you are different from your higher ranking competitors and by how much, you can rebound in 2 to 10 days simply by fixing those deficits. Every keyword is different and has different competing results so the degree of tuning you need from one keyword to the next is always different. You need to measure your differences and fix your deficits. We create software to make getting that information easy. Odds are if you are in the survey group that saw ranking losses then you should probably pick 5 or more of the factors listed in column B and make them better on your page. You will probably see at least some rebound fairly quickly from that. For more specific recommendations please contact me through my website SEOToolLab.com. To be clear - Google is saying there is nothing specific to fix. Just work on making your site better overall and give it time. Google and many SEOs are probably shaking their heads at this post - and I do not blame them. Adding 100 more keyword phrases to your page is going to make a difference, really? I am skeptical as well - really. But I wanted to represent what some in the industry are looking at and digging into and you, as an SEO, can decide which path to take. So here are some actionable things you can do to make improvements. Will it matter? Well, try it and let us know. I am not 100% convince it will but so curious to hear from you all.